I made this tonight using my leftover Easter ham bone, and it was surprisingly delicious! I like that it's a non-creamy ham soup and it's so simple (in the crockpot!). I substituted celery for the green peppers, and I used a little less bouillon than it called for. Everyone (even my 2-year-old) ate it and loved it! 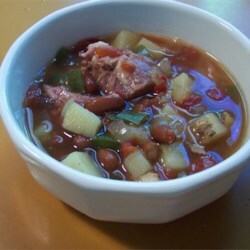 Place the ham bone, onion, tomatoes, kidney beans, potatoes, and green peppers into a 3 quart or large slow cooker. Dissolve the bouillon cubes in the water and pour into the slow cooker. Cover and cook on high until warm. Reduce heat to low and continue to cook 5-6 hours. (I just started mine on high and cooked for about 5 hours).